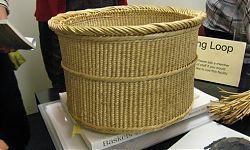 Last summer I went to a talk by Sherry Doyal, a conservator and basket maker, about waterlogged basketry and how to conserve it, and I’ve been meaning to write something about it for FROGs. 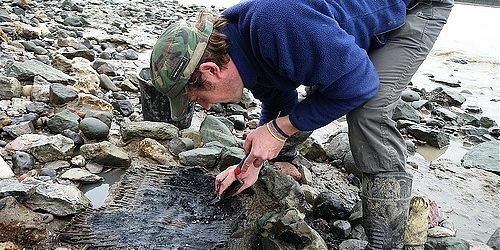 She made a study of different methods of museum conservation: much of what she talked about is beyond our capabilities, but I thought there could be occasions when we might find an object which would be lost to the next tide (like the fishtrap fragments found at Millwall), so I’ll concentrate on what we might find useful. When woody material like a basket decays, the cellulose which is 80% of the structure is replaced by water, and the whole thing becomes a bit like soft cheese. The water supports the weak structure that remains, and so to preserve the basket, the water has to be replaced by something. This will be a bulking agent of some sort. If the basket dries out in the air, it will shrink and be distorted, it doesn’t shrink evenly in all directions, so you can’t return it to shape by rehydrating it. So the important thing is to keep it wet. Sherry suggested that you could lift a waterlogged basket on site by sliding a support of fluted polyethylene underneath it, covering it in polyethylene and then wrapping it in aluminium foil. You would need to leave soil around it, or you could lift a whole soil block. Probably this is all best left to the archaeologists! Before all this you would need to record it on site with drawing and photography. If it then has to be stored with a view to conserving it, there are two methods, using a wet box or multiple bagging. Both of these aim to keep it wet and preserve the shape. 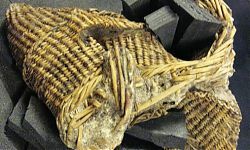 Sherry explained that basketry was already an ancient and perfected craft skill by the Bronze Age, but baskets do not survive very well in the archaeological record, unless they are in waterlogged sites. There is a lot that can be found out about a basket; what tools were used to cut the wood, was the wood from coppiced trees or just gathered, what plants were used, which might vary according to the climate. (Most modern British baskets are made out of willow, but this wasn’t always the case in the past.) 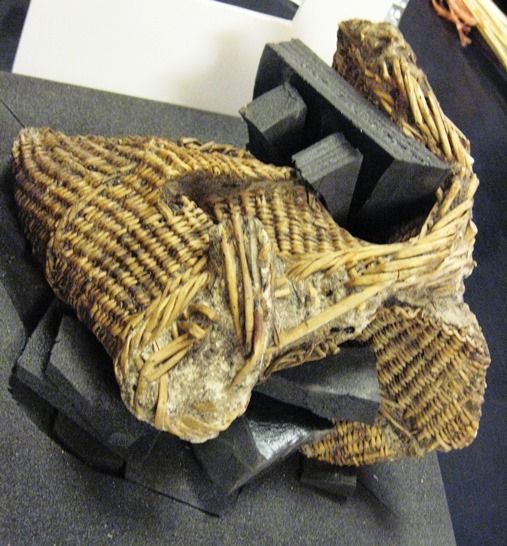 If a basket is lifted in a whole soil block, it can be micro-excavated in a conservation lab. Baskets can be used for all sorts of things, and Sherry gave us some examples of what has been found. At East Burghfield in Berkshire they found an eel trap made of split hazel, with the bark on it, very closely woven, which was possibly Saxon. 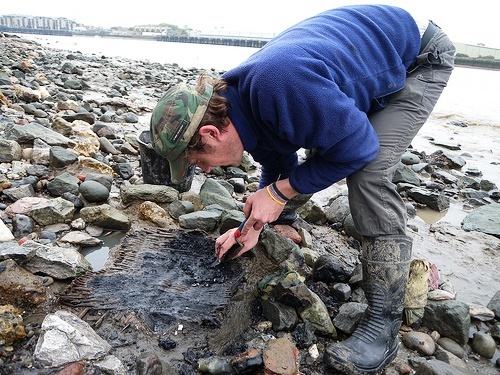 The Newport Ship Project had a 15th cent bilge filter. In a peat moss in Eshaness, Shetland they found a bag-shaped, twined wicker creel which was dated to 337-607 AD. At Vindolanda on Hadrian’s Wall there was an object of twined hair moss, which was probably a hat. I found an on-line photo where it’s described as a Roman wig! And closer to home, the Museum of London has an open weave fish trap, excavated at in the Tower of London moat (below), in which were found flint weights and fish bones. This is now on display in the museum’s Medieval Gallery. Sherry’s talk was followed by another, about a Roman basket found at Marcham, near Oxford. Sheila Raven told us about the site, a large Roman temple with other smaller shrines, and how the basket was found in a pit with other objects, which had been deliberately damaged, possibly “killed” to make them useful only to the gods. The basket had had its base cut off and there was also a cut in it. Felicity Wood and Sally Goymer, two basket makers, then told us how they had made a replica of the basket. It was made of skeined willow, that is, each willow rod had been split and finely shaved, and the upright stakes were so close together that each row took an hour to weave. The basket was made over a mould. It was extremely fine and represented many hours or days of work. I found this very interesting, because I think we usually assume that basketry will be utilitarian, but this was obviously a very special object indeed. I think we’d have to be very lucky to find anything as interesting as these baskets, but it’s worth being aware of what’s possible and how we might take care of anything we found.